Experience the color and glory of spring on this leisurely river cruise through Holland and Belgium. Float past blooming fields of flowers and windmills. Visit the expansive tulip fields of Keukenhof Gardens, home to more than 7 million tulips and one of the most visited attractions in all of Europe! Visit Kinderdijk, and see Holland’s largest concentration of windmills. Enjoy a canal cruise in the heart of Amsterdam. Step back to medieval times during a Bruges sightseeing tour. Sample artisanal cheese at a Dutch farm. Stop in Arnhem, the favorite summer retreat of the Dutch royal family. Experience Kinderdijk, home to Holland’s largest concentration of windmills. Explore “Liebfrauenkirche,” Belgium’s largest Gothic church. Travel to Arnhem, the favorite summer retreat of the Dutch royal family. 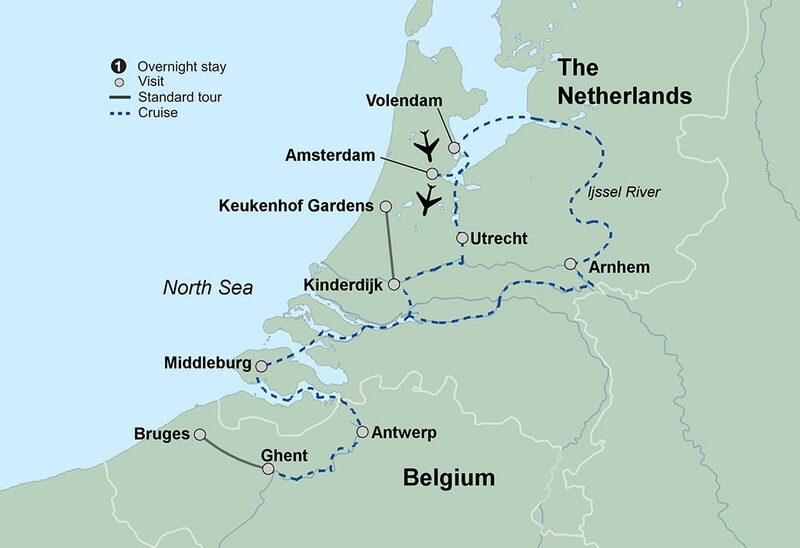 Savor springtime in Holland and Belgium with a cruise that is sure to leave truly memorable impressions. Admire the colorful glory of the blooming Dutch tulip fields and be astonished by the endless windmills. Winding waterways lead you to such well-known Belgian cities as Ghent and Antwerp. Your tulip-time cruise begins with an overnight flight to Amsterdam, a city filled with classic architecture, cafés, restaurants and canals. Your tour opens in Amsterdam, the 800-year-old thriving capital of the Netherlands. Board your ship and unpack once for a relaxing 7-night river cruise. Your beautiful vessel offers the newest technology, panoramic deck, panorama bar, delicious cuisine including regional wines with every dinner, and outstanding service. Tonight, a cocktail is served in the Panorama Bar offering you a chance to meet your fellow travelers before a lovely welcome dinner. Enjoy an overnight stay on the ship in Amsterdam. After breakfast, view some of Amsterdam’s most important sites and diverse architecture while on a city tour. You will also get to see the city from the water during a delightful canal cruise. Midday, visit the little fishing town of Volendam where you can still find fishermen dressed in traditional caps and baggy-legged trousers. A visit to a local cheese farm illustrates the process of how cheese from the area is made and also allows you the opportunity to sample some of the delicious results! During dinner, the ship resumes its cruise to the IJssel Sea. Late this morning we arrive in Arnhem, location of the favorite summer retreat of the Dutch royal family. This afternoon, pass by lovely Dutch scenery as your journey continues. Today your ship docks in Middelburg, the capital of the Dutch province Zeeland. It is known as “the monumental city” because over 1,100 monuments dot its landscape. This afternoon you may choose to take an optional excursion to the Deltaworks Project located at Neeltje Jans. This is an amazing example of how the Dutch have truly tamed the environment in which they live. Your excursion continues with a stop in the lovely town of Veere, a prosperous trading port in the Middle Ages due to the wool trade with Scotland; today it is a favorite spot for visitors. This morning you arrive in the Imperial city of Ghent. Lined with typical patrician houses in its city center, Ghent conveys the splendor of by-gone days. Perhaps you will join an optional sightseeing tour that includes St. Bavo Cathedral with its world-famous painting of the altar of the citizens of Ghent and the "Belfried" with its bell tower. This afternoon, allow yourself to be transported back to medieval times with a leisurely paced walking tour of Bruges, one of Europe’s most perfectly preserved medieval cities. Today the ship docks in Antwerp, Belgium’s second-largest city, which boasts beautiful Gothic and Baroque architecture and lively cafés. Antwerp is best known for its diamonds and also as the home of prolific painter Peter Paul Rubens, who spent much of his life here. Join a local expert exploring Antwerp’s historical sites including the "Liebfrauenkirche," Belgium’s largest Gothic church; the legendary Brabo Fountain; and the Rubens House. The afternoon is at leisure for shopping and independent exploration. Tonight, the captain welcomes you to the elegant Captain’s Gala Dinner, immediately followed by an evening of dancing. A morning stop in Kinderdijk, a UNESCO World Heritage site, allows you to experience Holland’s largest concentration of windmills, many still operating, and to get a revealing glimpse into Holland’s age-old battle with the sea. After lunch, explore the world-famous Keukenhof Gardens, spanning more than 70 acres within a beautiful park of tranquil ponds and shaded paths. With more than seven million tulips and other flowers on exhibit, Keukenhof is a kaleidoscope of color in bloom. Your day concludes with a farewell dinner and a typical Dutch folklore show celebrating the end of an unforgettable river cruise through Holland and Belgium.